As you will recall, I wrote a post called To the Zim a few months back. It was based on my first visit to a small restaurant, Zim Zari, in a small town, Trinity. Well, I didn’t really care for Zim Zari but, both Mommy and Taylor loved it. So, when we surprised Taylor with an Early Birthday Present a few weeks back (Weekend in Tampa), one of our sure stops was to be Zim Zari. Well, Sorry Zari – I still don’t like you. We had been secretly planning this Birthday Weekend for 5 months. Right after we tried Zim Zari in March, and Taylor proclaimed how much he loved it, we added it to our itinerary. I knew right then that when we went back, I would not again be getting the tacos. As you recall from my review, I was not impressed with them. After reviewing the menu a few times over before we went, I decided I would try the Chicken Burrito. Perhaps I should have realized that the Chicken Burrito would be far too similar to the tacos. Looking back at it now, I realize I should have tried something different. 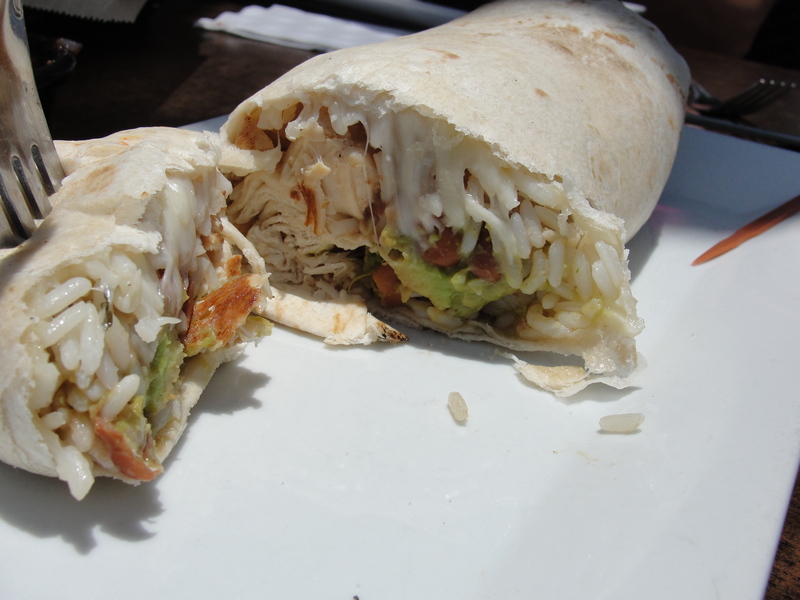 The Chicken Burrito has grilled chicken, pinto beans, rice, guacamole, pico de gallo, cheese, lettuce – all wrapped in a tortilla. The burrito arrived and looked pretty big in size. By the time the burrito had arrived, I had consumed nearly an entire basket of chips…on my own. I must say, Zim Zari has some great chips and salsa. Even so, I like to eat so I dove right into the burrito. 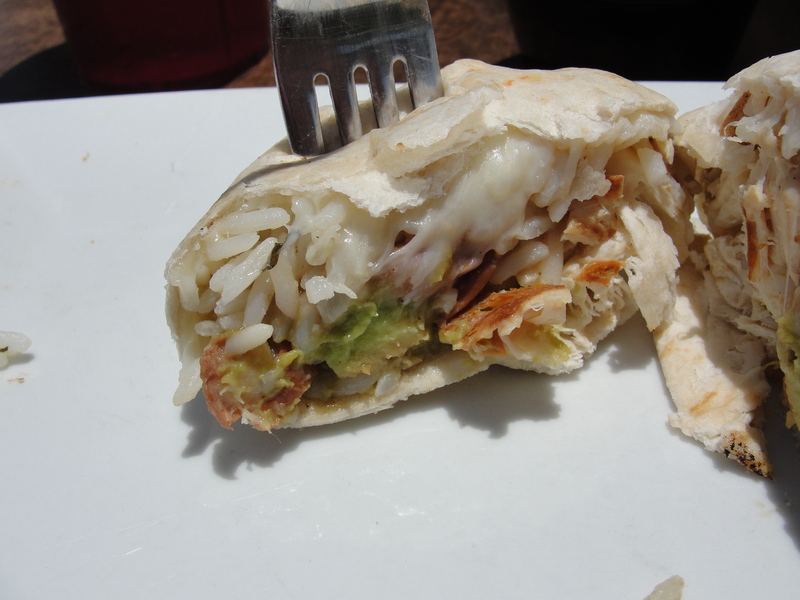 The tortilla of the burrito, was a bit crispy on the outside. 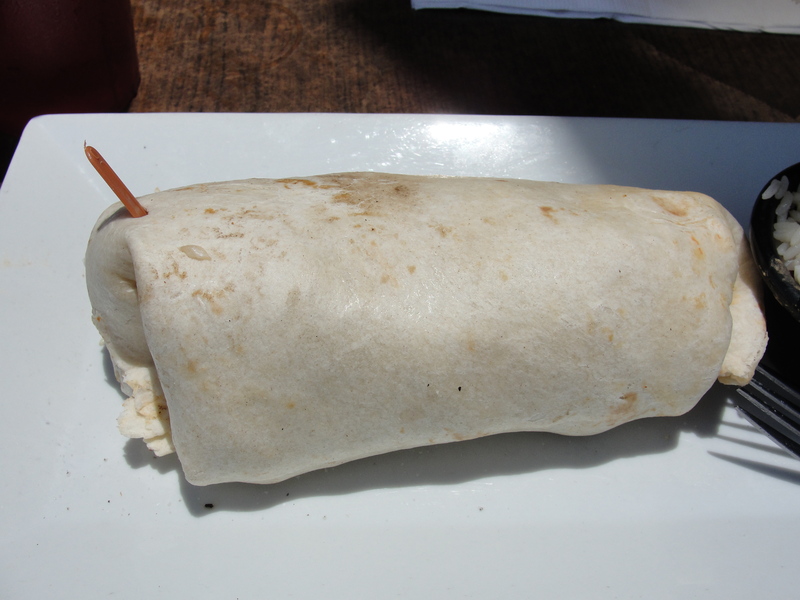 It felt warm to the touch, so I decided to cut into the burrito to begin with. I cut right into a large – like huge – amount of white rice. 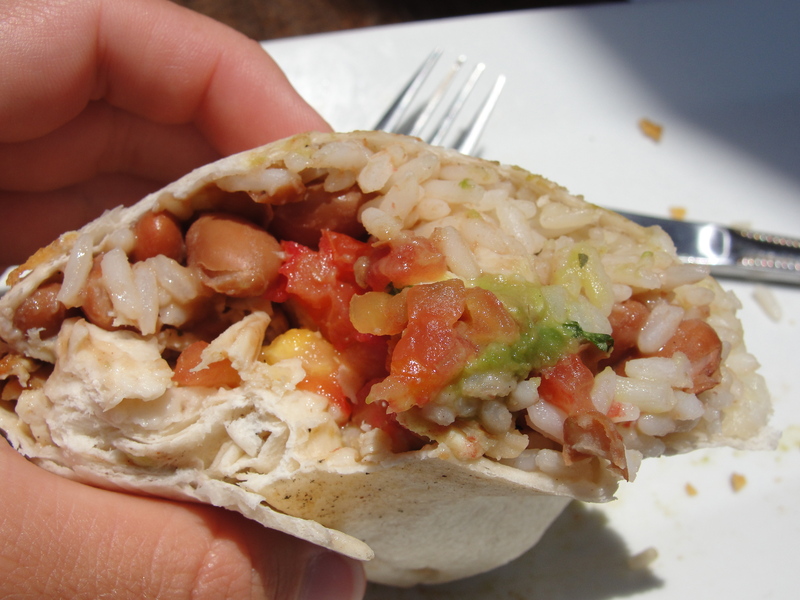 I must say, this burrito had a crazy amount of white rice…throughout the entire thing. I decided to cut another piece in and begin there. This piece had pieces of chicken with it and I started to eat. Well, I thought I was eating. I was chewing, my mouth was moving, I was swallowing but yet, I was not tasting anything. Like nothing. At all. No flavor. No taste. I found this to be the case in my next few bites of burrito as well. For almost half of the burrito, all I was getting was rice, chicken, cheese and beans. The rice tasted like white rice with absolutely not a lick of butter, salt, pepper…nothing. While the chicken was advertised as wood-grilled, it did not taste like a grill at all. It didn’t even taste like my Griddler. This really had me baffled. Had they simply forgotten all seasonings and flavors??? So was also the case with the beans & cheese. At least the beans texture was correct and the cheese was melted…even though neither had any taste. I decided to apply some of the homemade salsa to the burrito which did help quite a bit. It was not until I was half way into the burrito that I found the pico de gallo & guacamole – neither of which helped much. The homemade salsa I applied, was far better than the salsa within the burrito – I guess they used two different varieties. Even when I was able to find the pico and guacamole, the flavor of the burrito did not improve. This really stumped me. And it still does. How can a burrito possibly not have any flavor at all? So after two visits to Zim Zari, I can really say that I don’t like it. I like their chips & salsa, the seating and the wait staff is great. But the food? Not good. On this occasion, totally flavorless. This really confuses and baffles me but, it is what it is. Taylor and Mommy both loved their tacos once again and, in the end, that is all that really matters. It was the perfect lunch location for a Surprise Birthday Weekend for Taylor. I know I will be back to Zim Zari at some point. And I also know that I will not be opting for anything similar to a taco or burrito. While this pretty much limits my options, I feel as if it is my only choice. I do not want my third visit to be bad…I mean, I would like to like this place. Ohh well. For me, it was simply Sorry Zari.